​River Aura in Turku. Photo:City of Turku. The city of Turku is located on the Southwest coast of Finland on the shores of the famous Archipelago. The conference will be held at the Turku School of Economics (TSE), street address: Rehtorinpellonkatu 3. The school is part of the Turku University Campus area and located near the centre of Turku, about 1 km from the city centre Market Square. The easiest way to get to TSE from city centre (hotels) is to walk along the riverside, pass the Cathedal, continue to the street Hämeenkatu and turn left to the street Rehtorinpellonkatu. It is also possible to take a bus from the Market Square to Hämeenkatu. For example buses number 2, 2A; 4, 40; 50,51,53,54; 55, 55A, 56 all go along Hämeenkatu. All local buses from Hämeenkatu go to the Market Square. A single bus ticket with 2 hours of changing time costs EUR 3. Turku airport is located approx. 7 km from the centre of Turku. You can take bus no. 1 directly from Turku Airport to city center, which leaves each 20 minutes. Please find more detailed timetables here. The same bus goes also to Harbor. The ticket costs EUR 3 and EUR 4 between 11pm and 4am. Helsinki-Vantaa airport is situated in Helsinki. 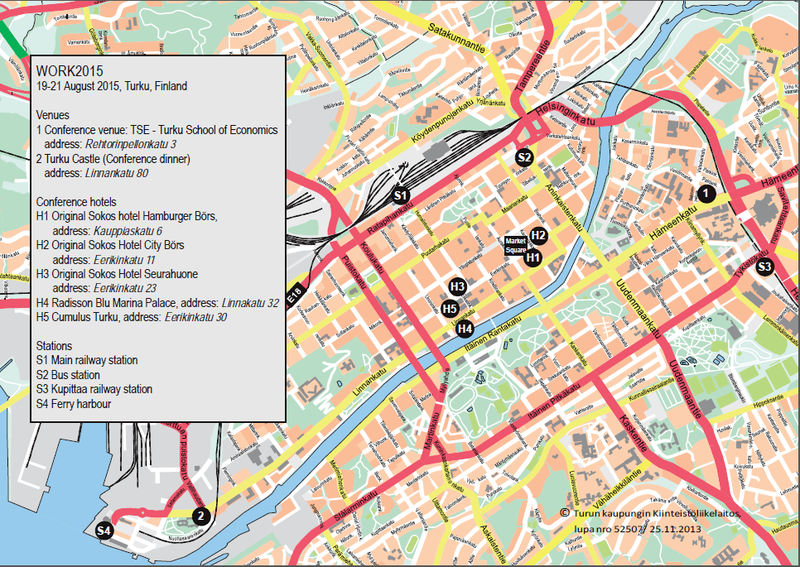 You can take a direct bus from airport to Turku, which will take approx. 2 hours. The ticket costs approx. EUR 30 one way. There is also a possibility for you to take bus to city center of Helsinki and take a train to Turku. Another option is to take the new Ring Rail Line from the airport to Helsinki, to Pasila station, and change in Pasila to a train to Turku. The Ring Rail Line trains run between the airport and Helsinki at ten-minute intervals at peak hours and the trip takes 22 minutes. Trains to Turku depart about every hour (between 5 am and 11pm). The trip to Turku from the Helsinki-Pasila station takes about 2 hours. More detailed timetables will be provided closer to the conference. For reserving a taxi, please call +358210041.